OMAHA, Neb. (KMTV) — On Saturday afternoon the Scott Frost and the Nebraska football team take the field for the annual Red-White Spring Game. Although the game is officially sold out, there are still tickets available on the secondary market. But will it cost you a pretty penny for a seat at the game? On secondary ticket marketplace sites such as StubHub, tickets are as low as $11 and selling for an average of $41. According to a StubHub spokesperson the get-in price for the game is $18. With 1,200 tickets available on this site alone, there seems to be plenty to purchase ahead of game day. At Ticket Express in Omaha, the company’s lowest ticket is $15, while its priciest is $158. 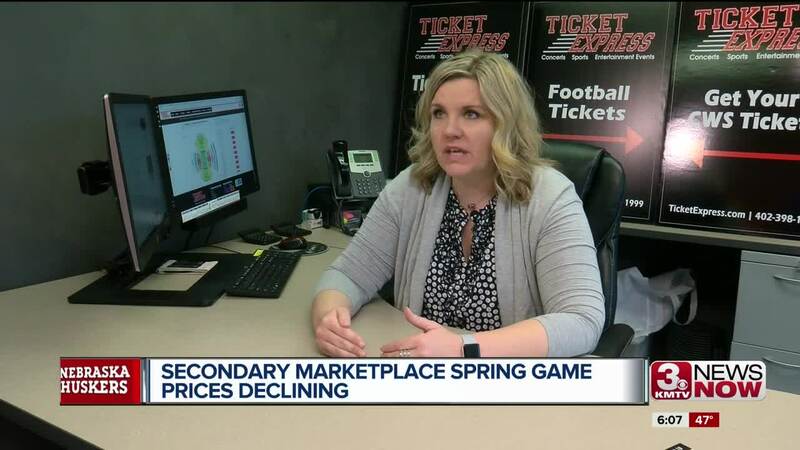 “And believe it or not, in Nebraska they'll pay even more than that,” said Jessica Freedman, Ticket Express' Vice President. Unlike Stub Hub, at Ticket Express, the company determines the selling price. Freedman says the company has dropped prices over the last few weeks. “We have lowered our prices fairly consistently as we continue to see what the demand is and what the weather is doing,” said Freedman. One factor in the drop of ticket prices is something fans didn't have control over. After flooding occurred across the state Freedman says fans started directing their funds towards home repairs instead purchasing entertainment such as football tickets. “Their original plans were to attend the game but now that they're dealing with flood issues or they lost their homes or a variety of other things that's changed their ability to go or not go,” said Freedman. However the Spring Game will still see more than 75,000 fans. Over the last ten years, the Spring Game's seen an upward trend. The last two years are in the top-three all time in Spring Game attendance and it looks likely this year's game will be a top-three attended Spring Game. “I have no doubt like they always do that Nebraska will pack that stadium,” said Freedman. Click here for everything you need to know about attending the spring game.